While attending an outdoor concert at the North Carolina Museum of Art in the late 1990s, I remember feeling curious about a seemingly odd series of large shapes in various materials lined up between the museum building and the amphitheater. I also wondered about the geometric forms protruding from the stage in strange directions, and a gray-painted rectangle superimposed on part of theater seating area. I never closely investigated the objects, being more interested in the musical entertainment at that time. 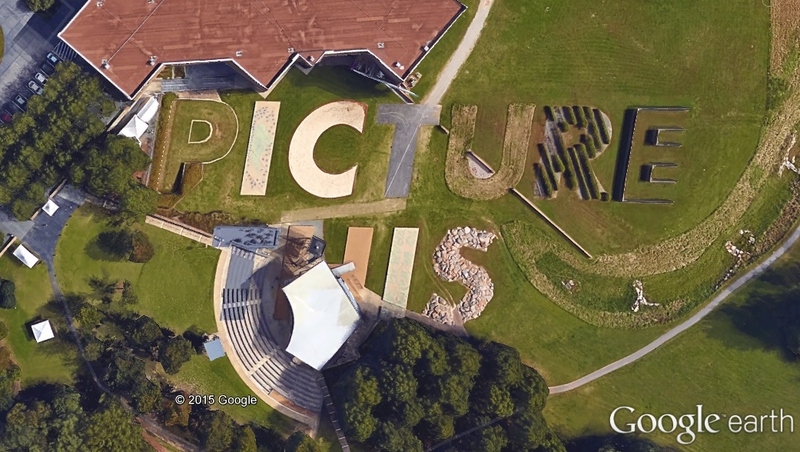 Then I happened to see an aerial image of the site, discovering that the shapes are actually letters spelling “Picture This”— clever, but really only when viewed from above. I later learned that some of the letters include phrases that reference the history, culture, and landscape of North Carolina – at least that is something to be gained when viewing the objects at ground level, where most people see them. In my opinion, for art to successfully function as part of the landscape of a public space, it not only needs to be comprehensible from eye level; it also should communicate well with its surroundings. Furthermore, the design should include a sufficient amount of elements at human scale (such as seating and planted areas), especially when a plan includes vast expanses of pavement. In recent years, various blogs I’ve followed have included striking images of public landscapes with interesting flowing forms, geometric lines and shapes, and bright colors. Many of these photos, however, were taken from above. 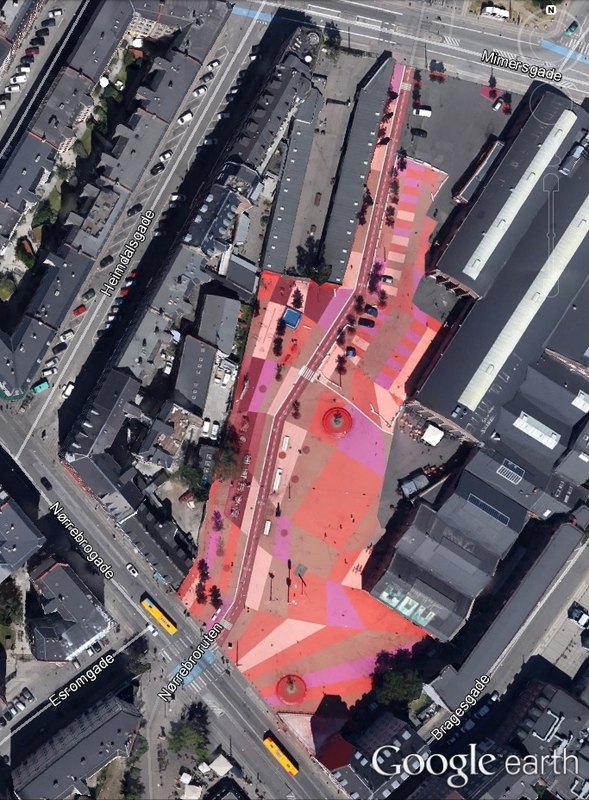 For some projects, aerial images were the only ones included, which makes me wonder whether these spaces truly work: Are they comfortable and inviting places? Do people tend to linger in these settings, or are they devoid of much activity? One such project that intrigues me is the seafront promenade in Benidorm, Spain, probably because of its rainbow of pavement colors and curvy walls which mimic ocean waves. I haven’t visited this beach, so I couldn’t say whether it succeeds as a public space, but I like how each color lends some identity to every section of this extensive walkway, instead of repeating the same pattern and/or colors along its entire length. I think that certain unifying elements are important throughout any type of site design; but long, linear spaces should include some variety as well, to avoid creating a monotonous experience along these corridors. For comparison, in another part of Spain, a median promenade along the Avenida de Portugal, in Madrid, includes large flower motifs throughout its length, referencing a valley in the region known for its cherry blossoms. 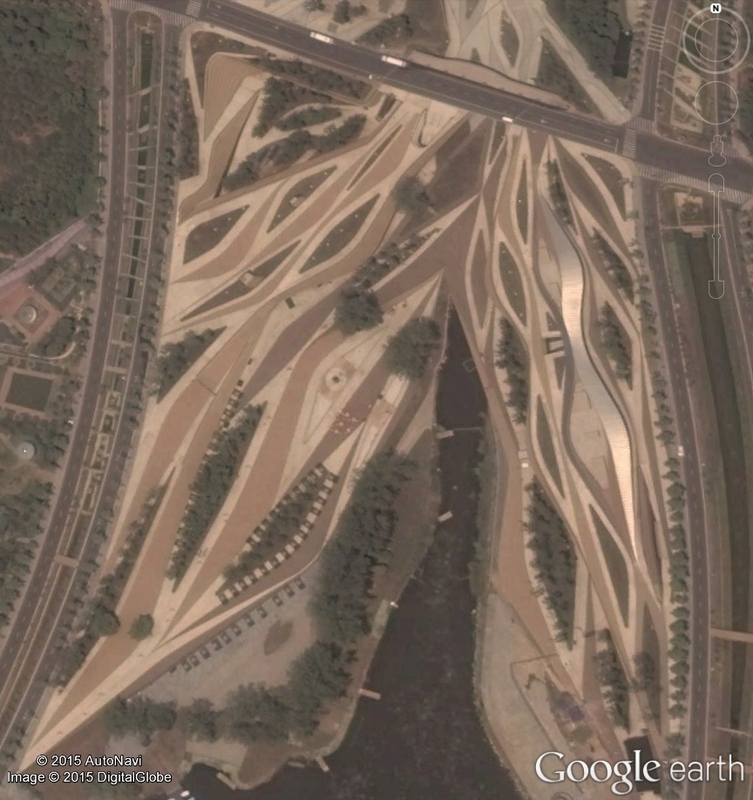 The median is actually the roof of a highway tunnel, and the image below only shows one portion of this walkway. I’m curious to know whether this space is well-used. 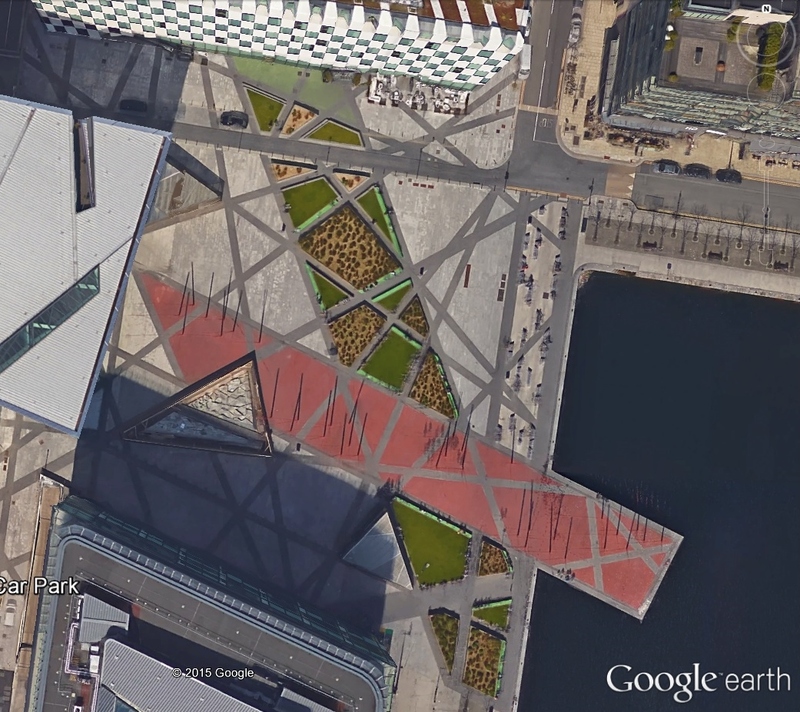 The following aerial images include a few more public spaces which are fascinating and attractive when viewed in two dimensions. Some of these and others that I’ve seen in photos from above make me think of abstract paintings or fiber art works. Do they function well in 3-D at human level? I will reserve judgment until and unless I have the chance to experience them in person. (Even photos taken from the ground don’t often give me a sense of how a space feels.) If any of my readers have been to these or other sites with an emphasis on artistic forms, I would love to hear some comments. All images obtained from Google Earth. 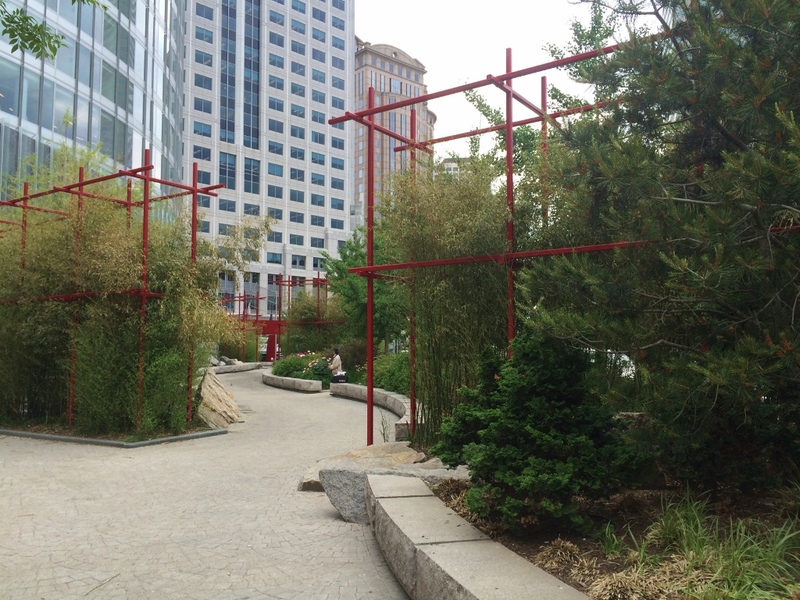 The Rose Fitzgerald Kennedy Greenway is a 15-acre linear urban space in downtown Boston, sited on land where Interstate 93 was previously located (now in a tunnel below). 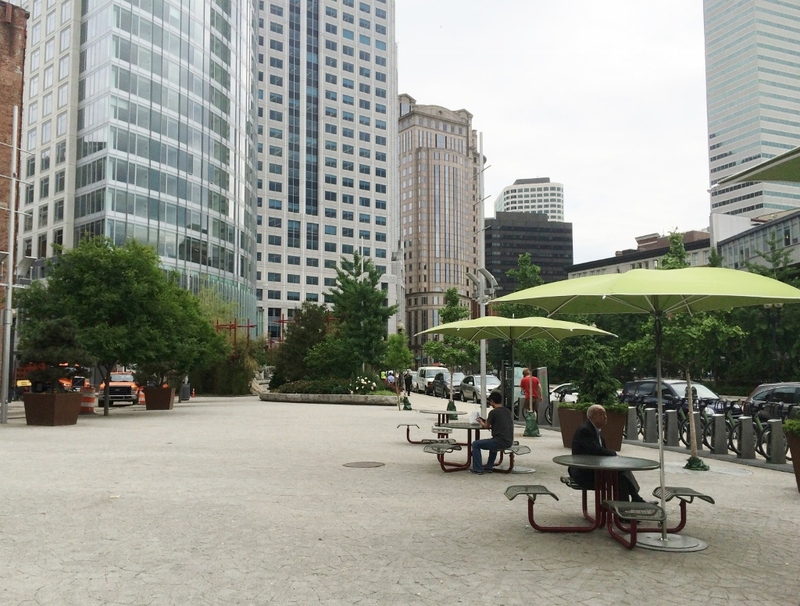 The greenway has been criticized for not being designed cohesively; however, the space should instead be considered as a series of disparate urban parks, each with its own merits. 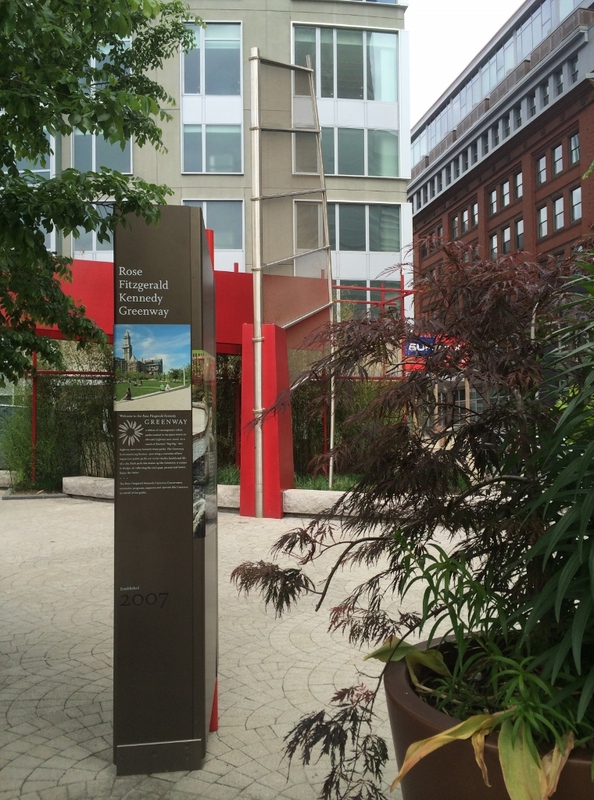 One of the better-conceived spaces along this route is Chinatown Park, located at the southern end of the greenway. 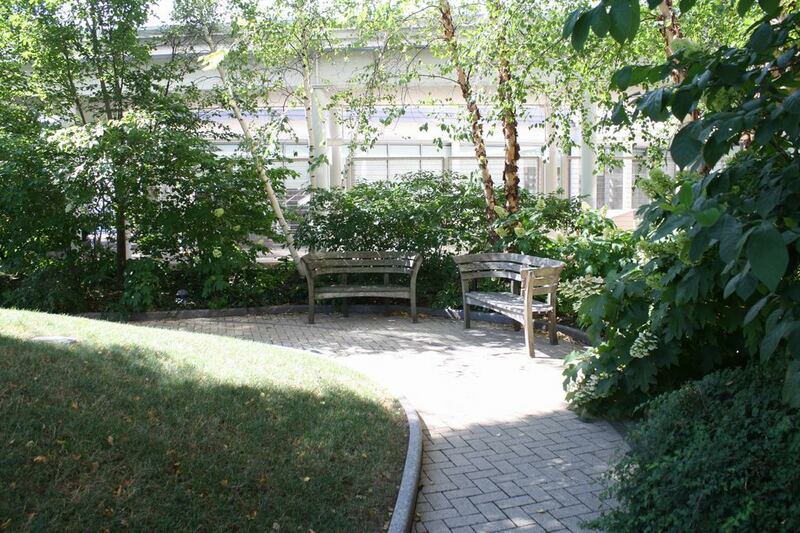 It was designed by Carol R. Johnson Associates, a Boston-based landscape architecture firm. 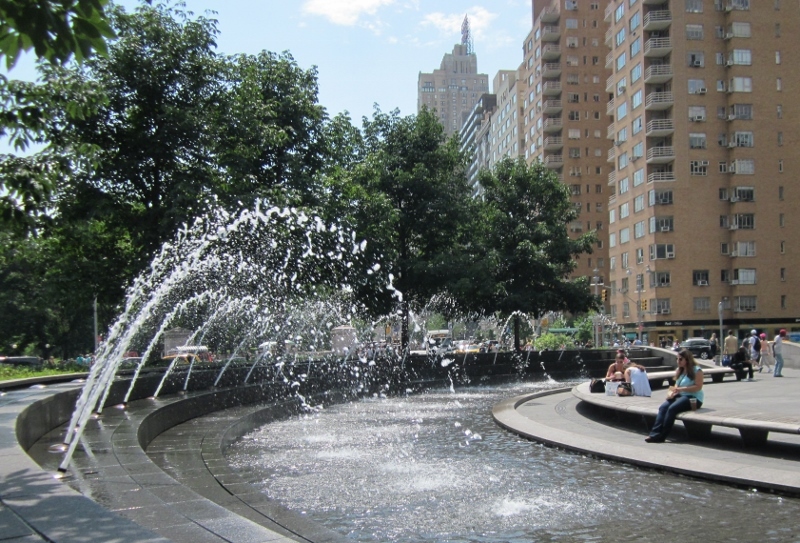 The park is approximately three-quarter acre in size, and includes a curvilinear path with red sculptural features, a waterfall fountain and stream, plants native to Asia, and a plaza for festivals and other activities. China’s culture, history, and natural scenery are all represented by the park’s elements. 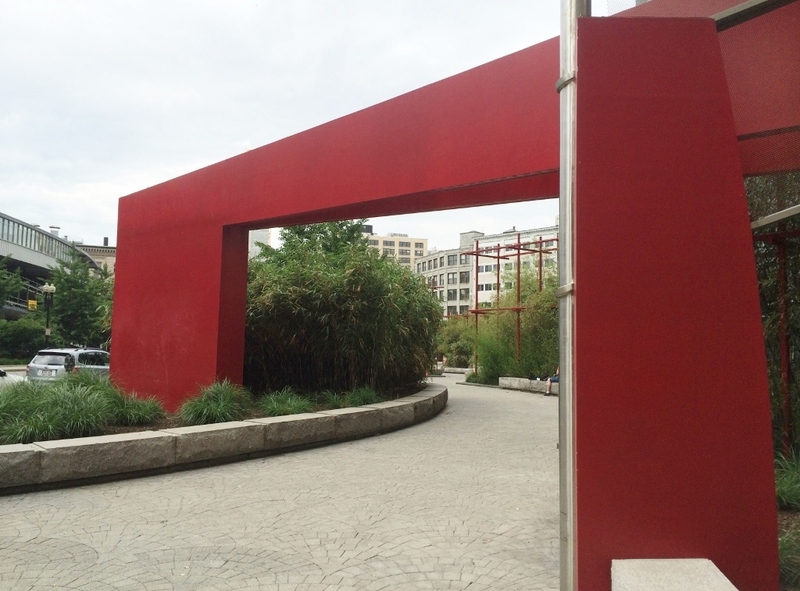 This bold, modern gate at the north entrance of the park is a counterpoint to the ornate, traditional Chinese gate to the south (shown in later photo). Red is a very popular color in China, representing good fortune and joy. North park entrance – The sculpture in background is entitled “Zheng He’s Mizzen Sail”. The park’s pavement pattern symbolizes the scales of a dragon. 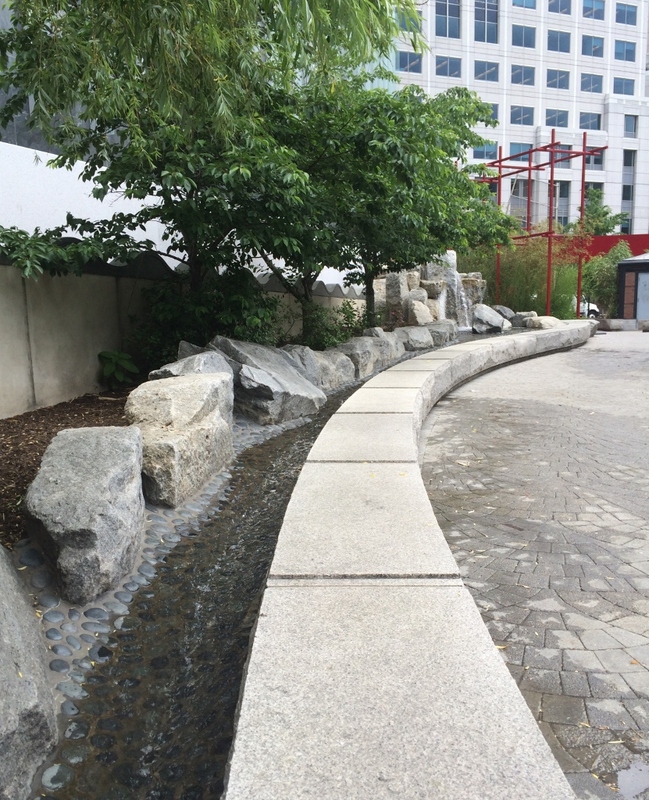 The waterfall fountain is composed of reclaimed seawall stones, acquired from a part of the Boston Harbor where many Chinese immigrants arrived. 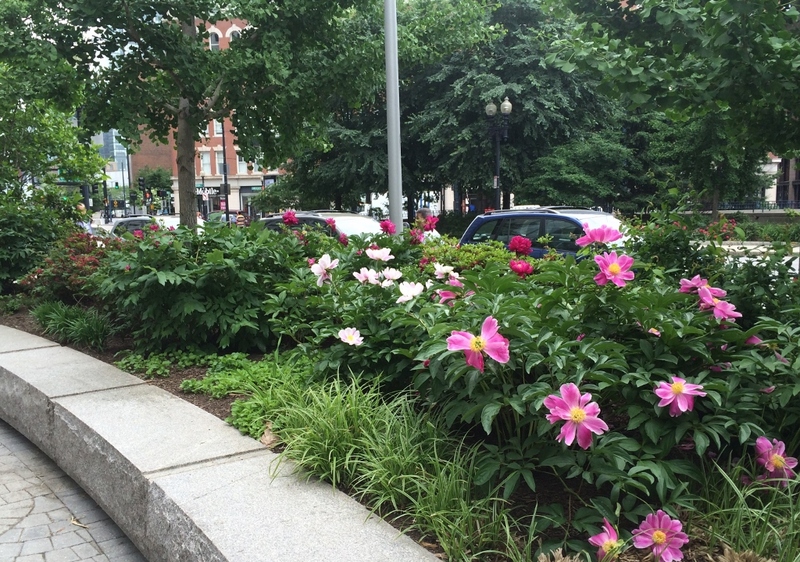 The park includes Peonies and many other plants of Asian origin. The traditional Chinese gate can be seen at the south end of the plaza. 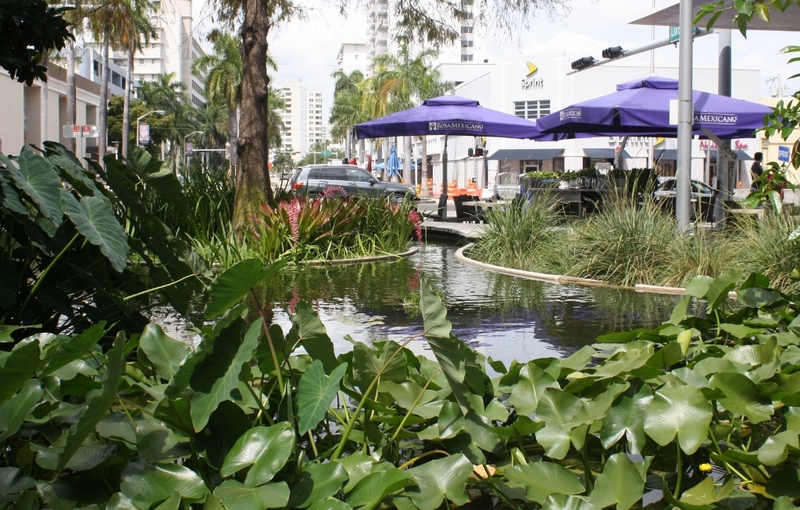 The Lincoln Road pedestrian mall in Miami Beach includes a relatively new addition: a block of water gardens that evoke Florida’s Everglades. 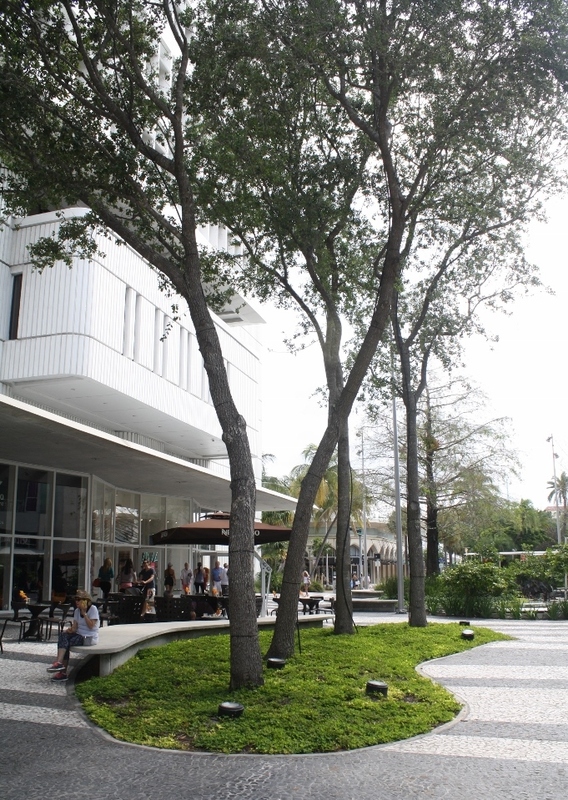 The site was designed by the landscape architecture firm of Raymond Jungles, Inc., and construction was completed in 2010. 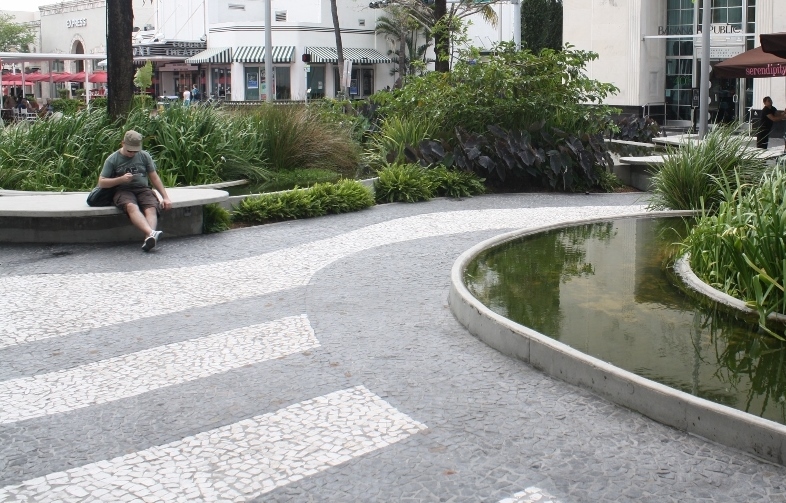 The surfaces of the water gardens are raised above the surrounding pavement, and include many native plants such as Bald Cypress, Red Mangrove, and Pond Apple. 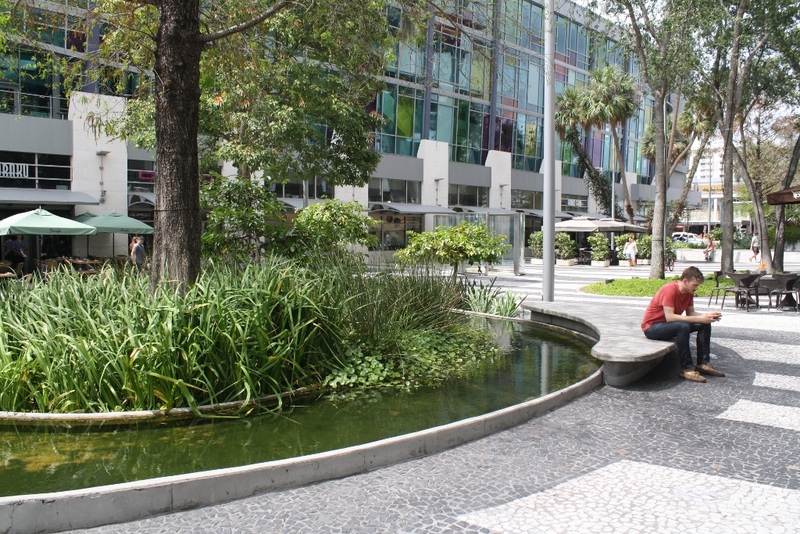 The biomorphic shapes of the gardens and seats are juxtaposed with the bold linear pattern of the surrounding pavement, creating an interesting combination of urban and natural themes. 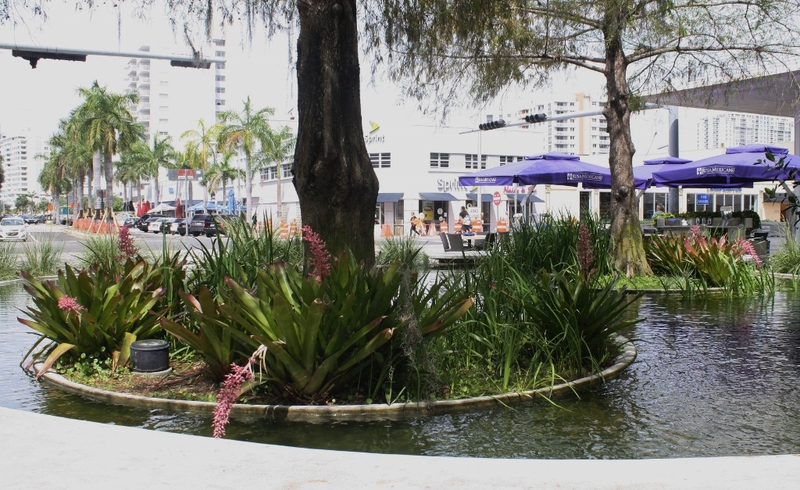 The gardens include a variety of plants that thrive in or near water, with an emphasis on native vegetation. Islands in the water gardens – these ones include large Bald Cypress trees. I’m guessing that the surrounding water somehow infiltrates the soil in the islands from below. The gardens are raised above the surrounding pavement – some more than others. Mosaic surfacing forms bold stripes in the pavement. 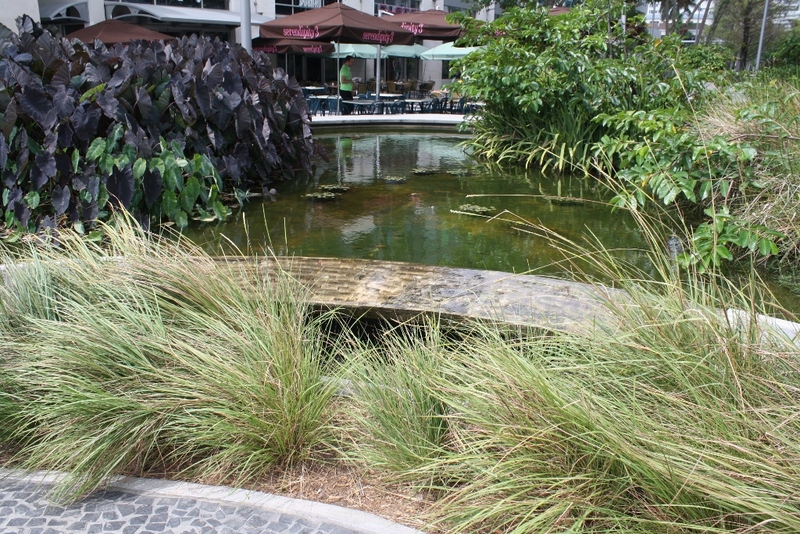 Water flows over this pond edge into a drain for recirculation. The central islands of most traffic circles in the U.S. are just planted areas, at best, with no consideration for public use. To be fair, the majority are either too small or in areas with too little pedestrian activity to work well as park spaces. 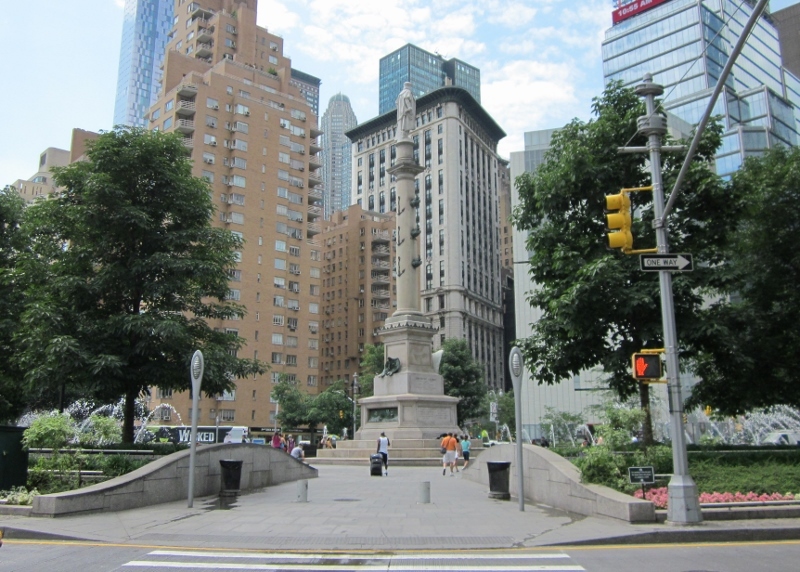 Columbus Circle in New York City, however, has neither of these limitations. It also has the benefit of traffic signals at its three crosswalks/entrances. 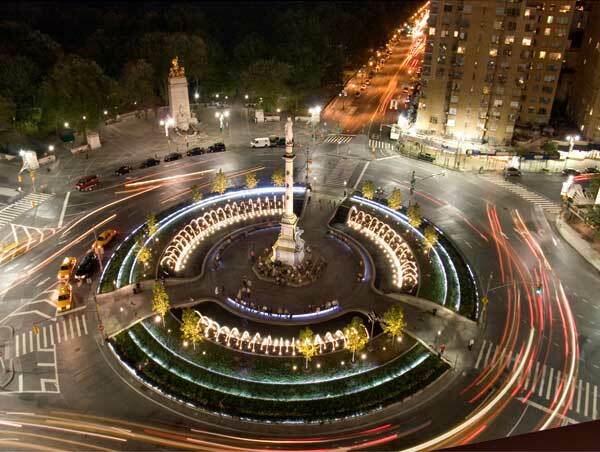 This century-old site underwent a major transformation in 2005, when a barren traffic island with a tall monument to Christopher Columbus was reshaped and expanded into a much larger circular park. 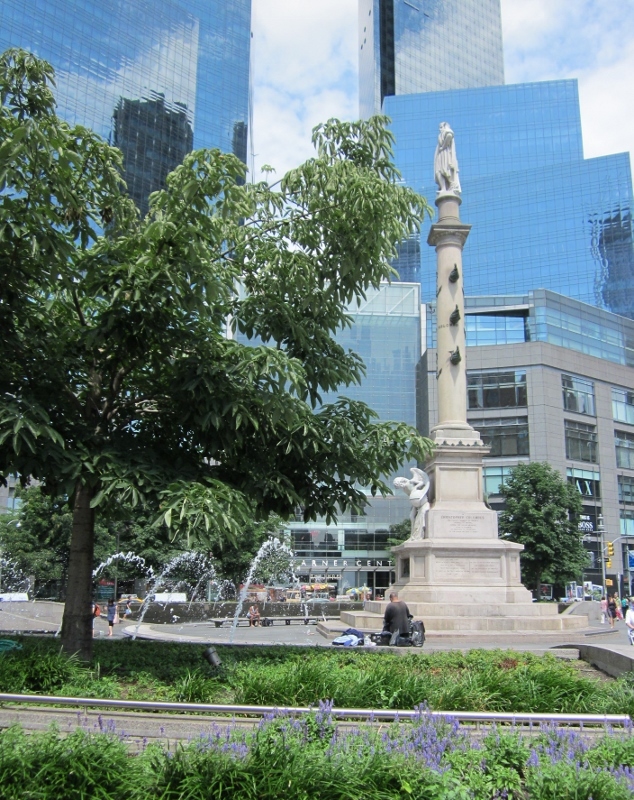 It’s truly an oasis in the city, where traffic noise is muffled by the sound of the fountains that border the pedestrian space, and groups of trees along the perimeter provide some visual separation from the surroundings. Long, wide benches arc around the perimeter of the central plaza. 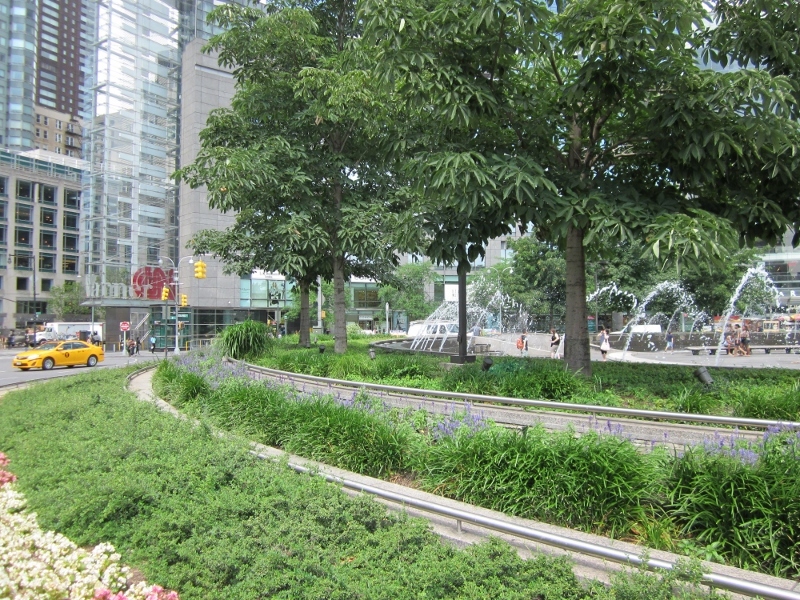 Terraced plant beds form the circle’s boundary. While visiting Montreal recently, I came across a number of public spaces with attractively-patterned pavement, many combining various types of stone. My favorite was Place d’Armes, which was renovated in recent years, but other fine examples are shown below as well. Place d’Armes, in Old Montreal, includes smooth granite pavers in various shades of gray, interspersed with stripes of pinkish cobles. The custom-designed tree gates coordinate well with the coble patterns. The cobbles in the streets surrounding Place d’Armes are repeated in random stripes within the perimeter of the plaza. The large, central, open area of the Place d’Armes includes gray granite pavers punctuated by these pink ones sporting fleurs-de-lis. The renovated Square Dorchester includes pavers with a range of textures. The smoothest ones shine both during day and evening, giving the walkways a glittery appearance. Intermittent crosses in the pavement at Square Dorchester, formed with rough-textured pavers, signify the historic use of this space as a burying ground. Metal drainage grates serve nicely as linear accents in this park next to Montreal’s convention center. 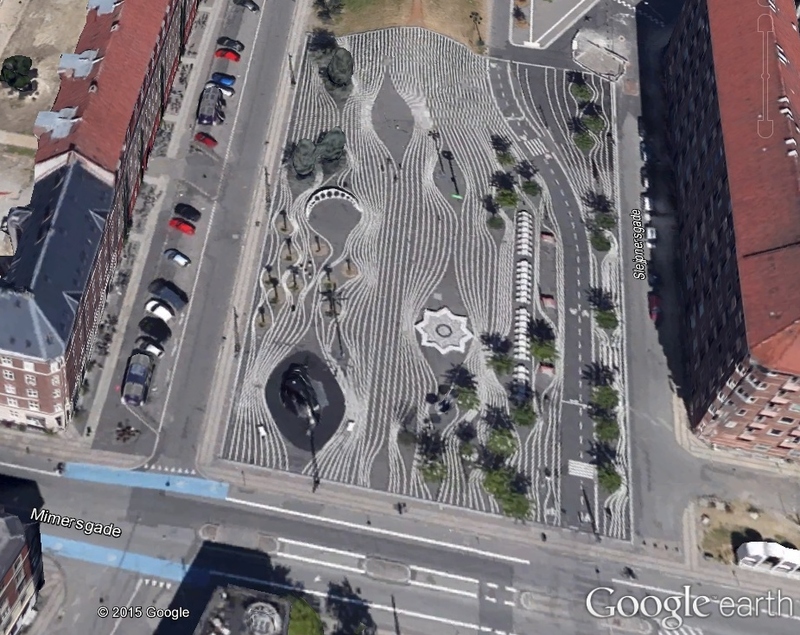 Strips of white pavers repeat the linear pattern of water jets in the Place des Festivals. 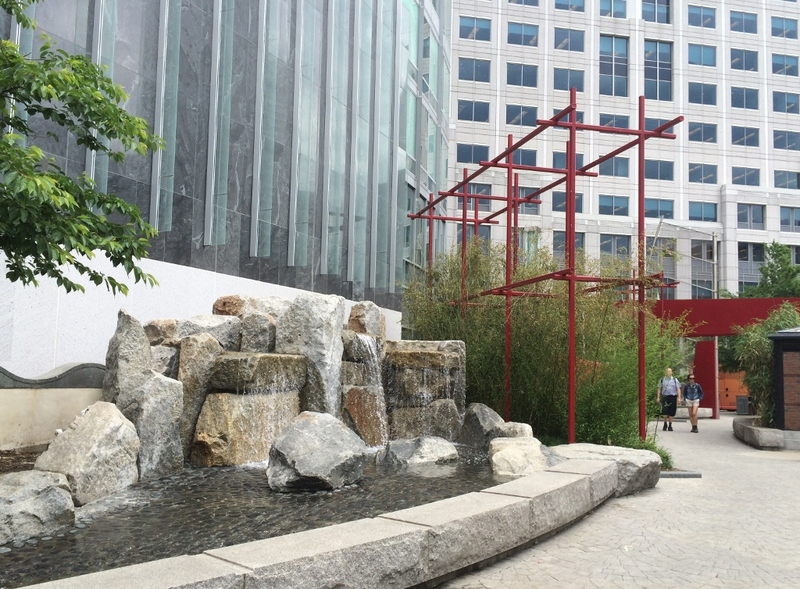 There are several nicely-designed outdoor spaces in south Boston that are open to the public even though they are privately-owned. 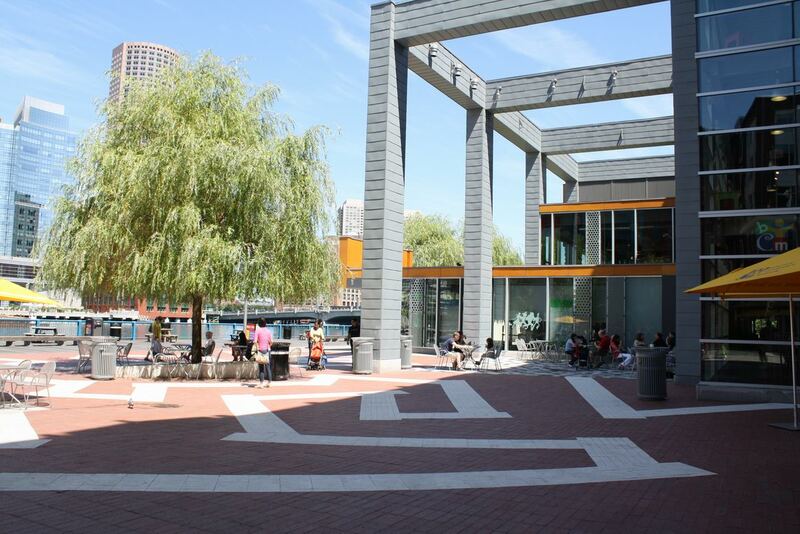 On a recent outing, I visited five of these spaces, located in the Seaport district of the city, and all within walking distance of one another. 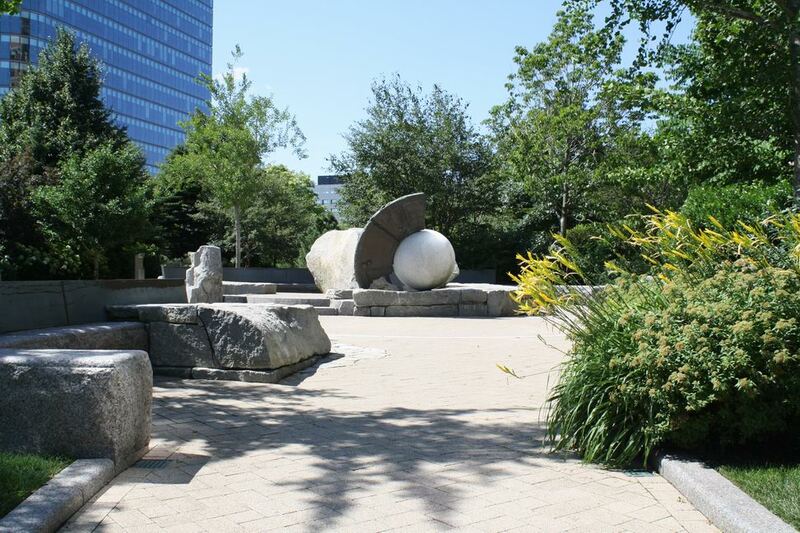 These include Eastport Park, South Boston Maritime Park, West Podium Park, The Fan Pier Public Green, and the entrance area of the Boston Children’s Museum (owned by a private, non-profit organization). These spaces run the gamut from cozy gardens to active plazas and expansive lawns. A taste of each is included in the photos below. I will be writing more about some of these individual places in future posts. 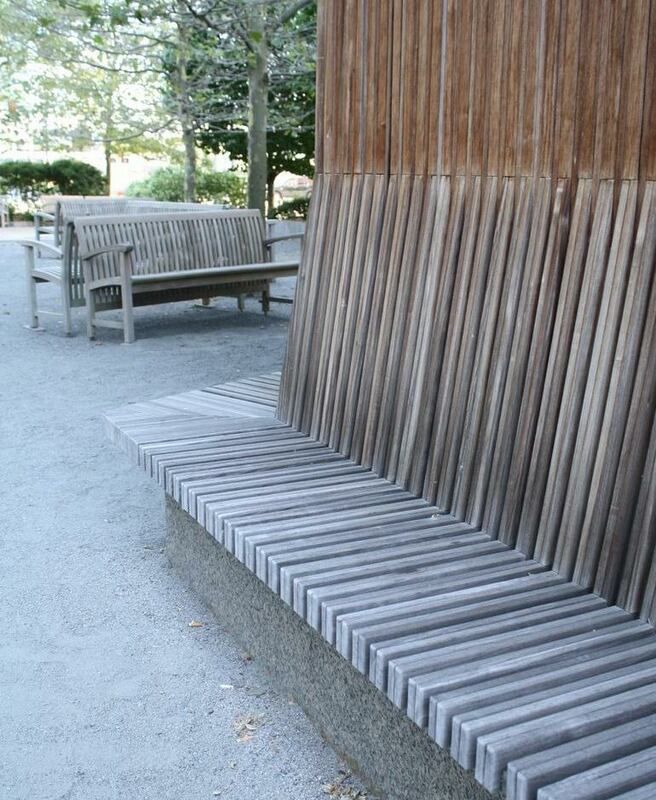 An attractive bench is integrated with a building in South Boston Maritime Park. 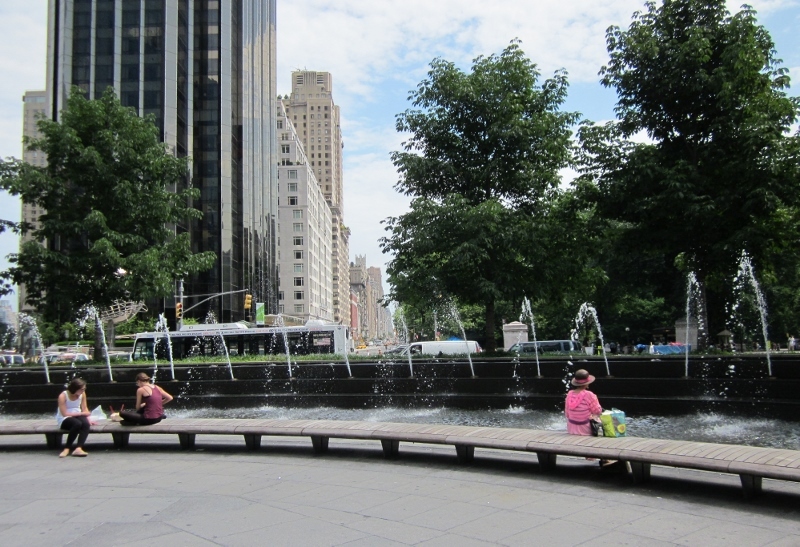 This park also includes a large lawn and a sculptural shade structure with tables and chairs. 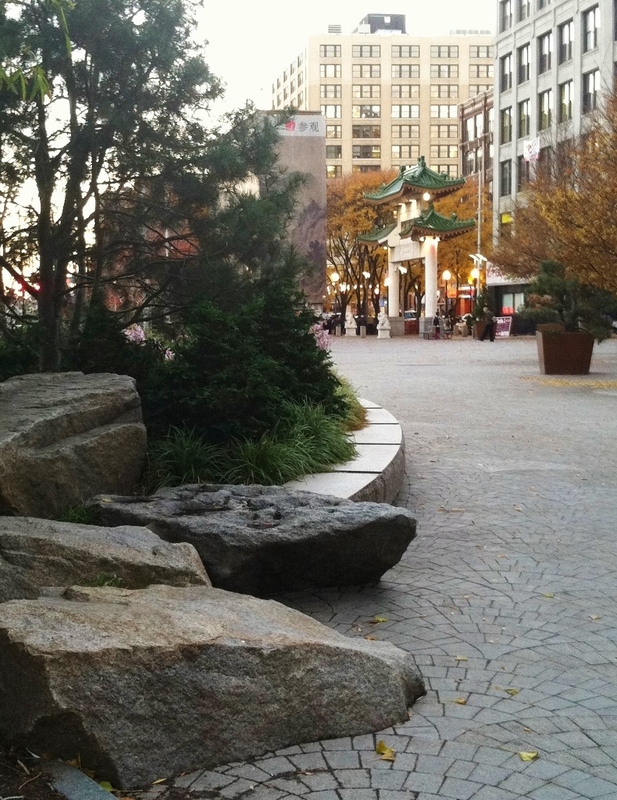 West Podium Park is actually a roof garden, and includes several pleasant seating areas. 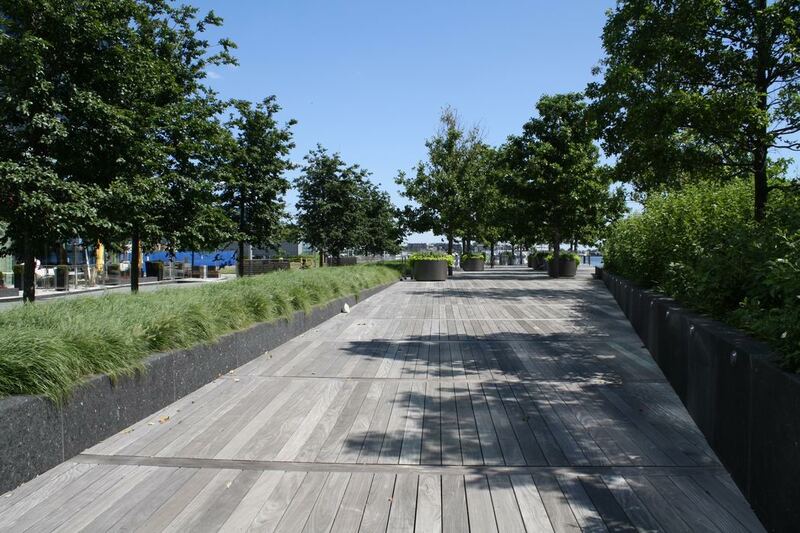 The Fan Pier Public Green includes this pedestrian walkway which leads to seating areas along the water. A large lawn space is adjacent to this.